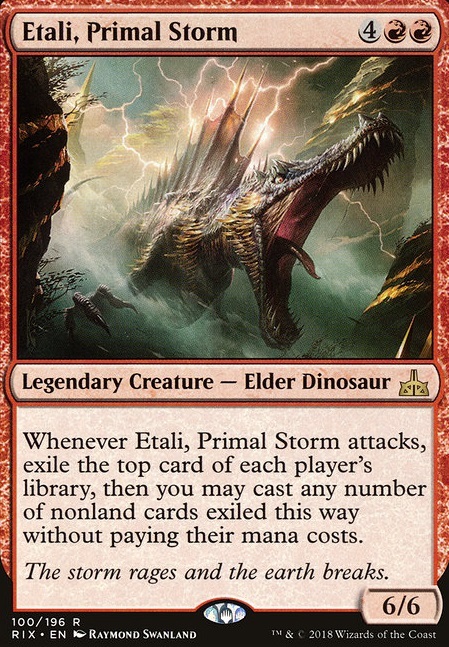 Whenever Etali, Primal Storm attacks, exile the top card of each player's library, then you may cast any number of nonland cards exiled this way without paying their mana costs. No, no, no.... I am the master of decks that always are dynamic (they don't always win but they just seem to stay fresh!)... 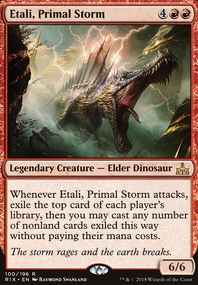 & I say, sez I: That Etali, Primal Storm is the master of freecast, who always plays different, and is just a blast. Casting stuff for free... hmm. Narset, Enlightened Master or Etali, Primal Storm are options. 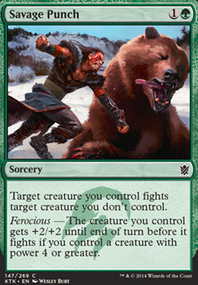 I LOVE this deck strategy, and there's a lot of cards that can support it (it's also super fun in commander). You are in red so if you want to go the Traitorous Blood , Hijack , etc. route, you easily can. First thing that comes to mind of though is Knowledge Pool . Absolute sh*tstorm every time, so much fun. 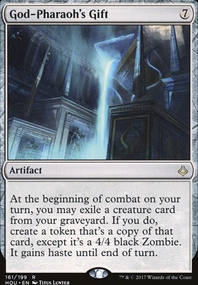 In blue, there's also a bunch of cards like Bribery , Jace's Mindseeker , and Sphinx Ambassador that you could add. Blue of course has a bunch of cloning. I see you're not running Vizier of Many Faces . Besides the aforementioned one turn steals like Hijack , red has things like Stolen Strategy , and Etali, Primal Storm . 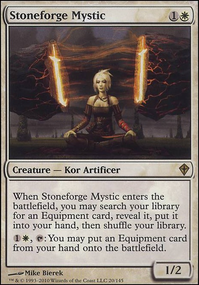 There are also some artifacts that come to mind besides Knowledge Pool , such as Vedalken Shackles , Chaos Wand , and Grinning Totem . Lastly, you have a bunch of other things thrown in here that don't follow this game plan (but do follow the game plan of your commander well). Things like Tatyova, Benthic Druid . I'm thinking you should make this specific deck less of a Stealing Deck, and just make it a better Kynaios and Tiro of Meletis deck. Then take all your Stealing cards and pick a different commander for that deck strategy (because it does sound super fun). Zedruu the Greathearted : You lose blue, which could be a big loss. But this also changes your deck strategy from Stealing to switching, which isn't that big of a difference but could be a lot of fun. Switch your Steel Golem for your opponents commander. Admiral Beckett Brass : Thieving, conniving, pirates. What more do you need? Still keeps your blue and red, and throws in black as well. This is all off the top of my head, but I hope you get some help from it. Doomsday is in, but the Lab Man pile is out. Ordering a few more foils. Looking to increase the creature presence, and I need to ensure I still have viable DD piles for the Dramatic Scepter win. Fortunately I only need to draw a total of 3 cards, not 6 like with Lab Man. I'm getting the Invocation Consecrated Sphinx and The Locust God . The God in particular should give me a lot of nice flying blockers (and attackers if needed). Also, obvious flavor win. Thief of Sanity is in. Evasive cheap body, and his ability lets me steal a card from hand and cast it myself. Total Nicol Bolas play. Similarly, I'm getting foils of Stolen Strategy , Etali, Primal Storm , Grenzo, Havoc Raiser , and Fiend of the Shadows . Not everything will likely go in, but they're all pretty on-theme. 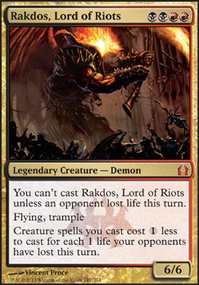 Rakka Mar is in for the Bolas flavor text and board presence. I'd also really like to add Tezzeret, Artifice Master . Makes flying blockers and draws cards, and if he gets his Ultimate it's an immediate Omniscience. 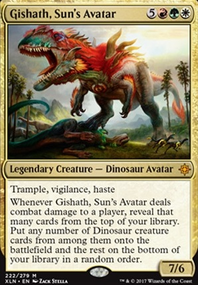 No real downside, and he is a slave to Bolas, after all. I'm running a risk of making the average CMC too high. The early game is rough unless I specifically have good defenses in hand. 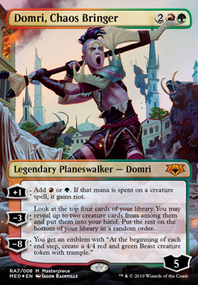 Etali, Primal Storm , Gonti, Lord of Luxury , Stolen Strategy , Praetor's Grasp and Dire Fleet Daredevil are some cards that come to mind when it come to playing opponents' stuff.